Before you decide to purchase a hog, you will need to understand how to care for the creature properly. Nutrition is an essential part of the hog's care; as he's a voracious omnivore who thrives on a varied diet. A young hog who is not fed properly will fail to grow adequately and may suffer from health problems. Diet is one of the primary reasons that the wild hog population in the United States continues to grow at a rapid, unchecked and often problematic rate. Hogs are omnivores, meaning they will eat both animal products and vegetation. 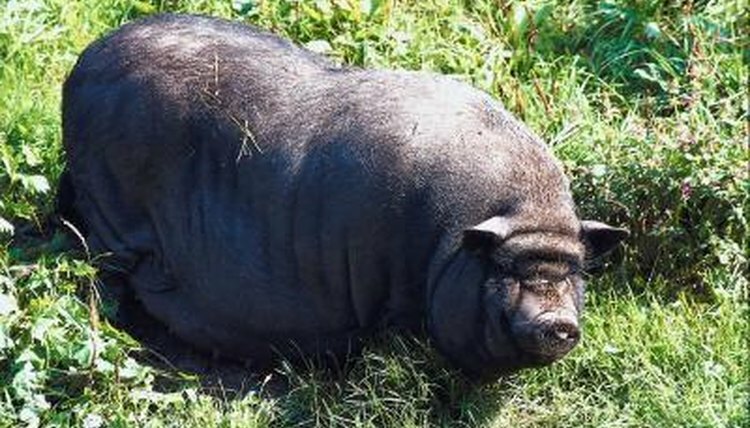 According to the Humane Society of the United States, a natural diet for a hog consists of mostly vegetation combined with reptiles, insects, worms, amphibians and even small rodents. HSUS also states that hogs may eat carrion and scavenge meat from any source where it is readily available. Texas A&M reports that 85 percent to 90 percent of a hog's diet vegetable-based with the remaining 10 percent consisting of animal products. Domestic hogs are rarely left to scavenge for themselves. Hogs will eat 3 percent to 5 percent of their body weight every day, according to a Texas A&M website. Most domestic hogs receive the majority of their nutrition from commercially marketed hog and livestock feeds. These feeds are designed to provide basic nutrition for all manners of swine and provide solid basic building blocks for most hog farmers' feeding programs. Hog feeds can be combined with additional foodstuffs or nutritional supplements to create a customized diet for your hog. Because hogs are capable of eating a very diverse diet, hog feeds can contain a wide assortment of mixed grains and vegetation-based substances. Common ingredients for hog feeds include wheat, corn, barley, oats and sorghum. Sorghum is a grass based substance commonly used in animal feeds and plant-based products. Feeds will also include a variety of vitamins and minerals. Animal byproducts often are in commercial feeds. The animal products in feeds may come from a variety of sources and are typically leftover from commercial processing, meaning the parts that are ground up and included in animal feeds are those that can not be used for human consumption. You can supplement your hog's diet with fresh plants and vegetables if you choose to do so. Some hog owners provide their hogs table scraps. The quality of your hog's feed plays a role in determining the overall health of your hog, so you should check with your veterinarian before changing your hog's feed or adding new items to his diet.